A few weeks ago, I finally enrolled on the course of my dreams (literally – I have great dreams! ), the Ecole Chocolat Professional Chocolatier programme. I have wanted to do this course since I first learned of it almost a decade ago, and I have wanted to be a chocolatier since I first tasted the heavenly stuff as a small child. I started working on my first practical assignment today, learning to temper chocolate. This is the method of heating and cooling the chocolate to precise temperatures to achieve stable crystallisation, which helps it set properly. 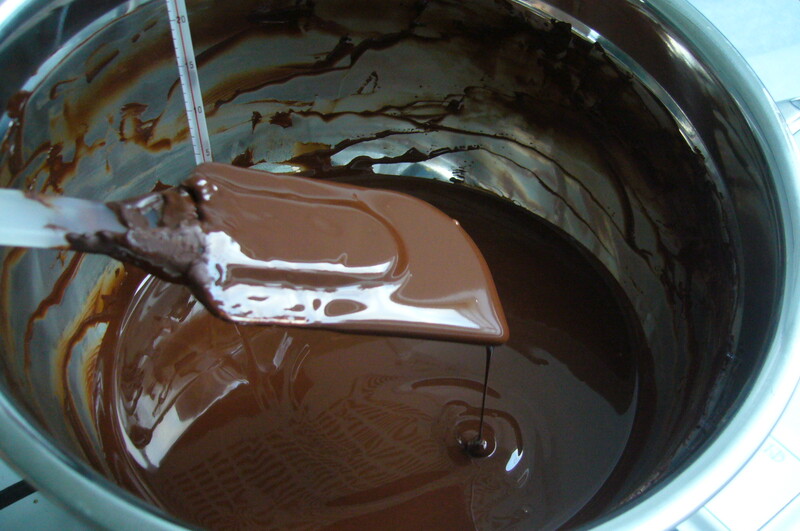 It also gives good chocolate its characteristic gloss and that fantastic ‘snap’ sound when broken. Just wondering, is this a course in the UK or somewhere else? (Noticed in your “About” you are in London, but didn’t know if that was London UK.) Chocolatier courses seem thin on the ground in the UK! Best of luck with the course, from the later posts it seems to be going brilliantly.